Cotswold Commons and Beechwoods NNR is the largest nature reserve in the Cotswolds. 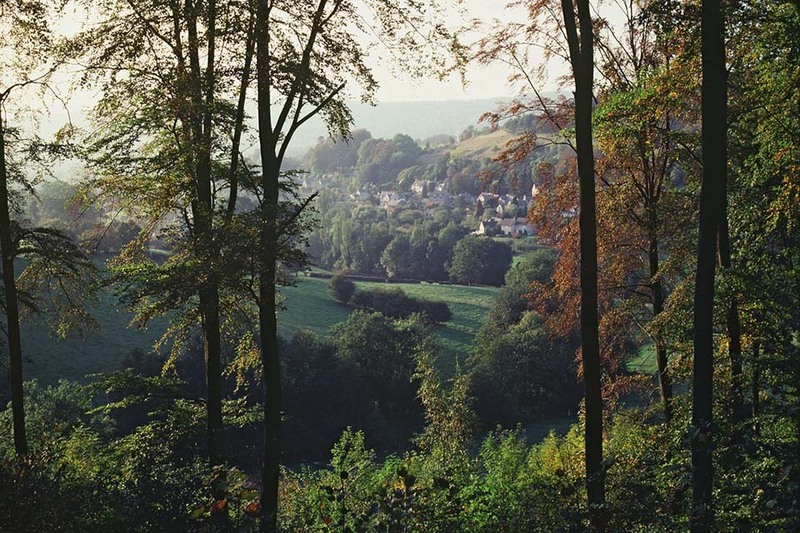 It is largely made up of a chain of beechwoods and limestone grasslands around the upper slopes of the Painswick Valley, in Gloucestershire. The beechwoods are protected as a European Special Area of Conservation because they are rich in rare wildlife. The grasslands of the commons feature a rich limestone flora including yellow rattle, knapweed, harebell and wild thyme. In early summer you can see an impressive display of orchids, among them early purple, pyramidal, greater butterfly, common spotted and fragrant. All these plants support a variety of insects, particularly butterflies. These include chalkhill blue, Adonis blue, small blue, dingy skipper, green hairstreak and the rare Duke of Burgundy fritillary (at Rudge Hill Common). You can see other butterflies in the open areas within the beechwoods, including silver-washed fritillary and white-letter hairstreak. Among the trees you can see plants like stinking hellebore, common wintergreen, bird’s-nest orchid, wood barley and broad-leaved helleborine. Buckholt Wood is especially noted for being home to over 780 species of fungi. The woodland animals include rare spiders and snails - many restricted to ancient woodland sites. Breeding birds include tawny owls, skylarks, tree pipits and lesser-spotted woodpecker, and kestrels and buzzards are often seen overhead. The majority of the reserve lies between the A46 and the B4070 near the villages of Sheepscombe and Cranham, and the reserve is accessed from these via various minor roads. Car parking is available at several car parks and lay-bys. The nearest rail stations are Stroud (8 kilometres to the south west) and Gloucester (8 kilometres to the north west). There are regular bus services from Stroud to Cranham Corner and less frequent services to Sheepscombe and Cranham village. For details go to the Traveline south west website. The Cotswold Way passes through Edge Common, Pope’s Wood and Buckholt Wood. The Wysis Way passes near the reserve. Highbury Wood NNR is a link in an almost unbroken chain of ancient woods stretching from Chepstow to Ross-on-Wye. Highbury Wood lies on the eastern bank of the River Wye and is a prime example of the very rich and diverse woodland for which the Wye Valley is internationally important. The site is noted for its variety of woodland types, reflecting the wide range of soils, aspect and drainage on the site. Large-leaved lime, which is restricted to the Wye Valley, wild service tree and whitebeam are among the scarcer trees of Highbury Wood. Some yew trees found on the site are more than 300 years old. Newly-coppiced areas provide open ground conditions which favour light-demanding flowers such as primrose and early purple orchid. Wood spurge also emerges with increased warmth and light. These conditions favour insects which feed on the abundant nectar and benefit from the shelter of the surrounding trees, such as butterflies and dragonflies. See the site information leaflet for more details. Highbury Wood lies within the Wye Valley Woodlands Special Area of Conservation. For detailed ecological information see Highbury Wood Site of Special Scientific Interest citation. The reserve lies on the eastern bank of the River Wye near the village of Redbrook. Access is via minor roads from the A466, A4136 and B4228. There are bus services along the A466 from Chepstow to Monmouth via Redbrook. See the Traveline south west website for details. Offa’s Dyke National Trail crosses the reserve. The Wye Valley Walk runs nearby. Lady Park Wood is part of a large woodland complex in the Wye Valley Woodlands Special Area of Conservation. Please note that access is limited to public rights of way. Other access is by permit only. Lady Park Wood is a prime example of unmanaged, near natural woodland. The reserve was established by the Forestry Commission in 1945 as a long-term ecological project. Research aims to explore the natural processes that take place without human intervention such as tree felling, thinning or coppicing. Beside the common tree species of beech, oak, ash, wych elm and birch, the site is also home to both native species of lime (small-leaved and the rare large-leaved lime) as well as a rare species of whitebeam (Sorbus eminens). The shrub layer is dominated by hazel but also contains dogwood, spindle, hawthorn, privet and holly. Ground cover mainly consists of dog’s mercury and bramble but plants of interest include wood barley, fingered sedge, wild madder, bird’s-nest orchid, toothwort, lily-of-the-valley and herb paris. Lady Park Wood has a rich breeding bird community which includes all three woodpecker species, redstart, wood warbler, tawny owl, pied flycatcher and treecreeper. A variety of rare bats have been recorded in the NNR, in particular greater and lesser horseshoe bats which are found here in significant numbers. Lady Park Wood lies within the Upper Wye Gorge Site of Special Scientific Interest and forms part of the Wye Valley Woodlands Special Area of Conservation. For detailed ecological information see the Upper Wye Gorge SSSI citation. Lady Park Wood straddles the border between England and Wales 3 km north east of Monmouth. Access to the reserve is from the A40 and A4136. There is no car park at the reserve; the nearest parking is across the river at the Biblins Bridge campsite. Monmouth is at the end of Route 30 of Sustrans National Cycle Network. The nearest stations are Lydney and Chepstow. Bus services run from Chepstow to Monmouth and from Lydney to villages near the reserve. See the Traveline south west website for details. Two major trails pass near the reserve: the Wye Valley Walk and the Wysis Way. The Hudnalls NNR is a woodland with limited management intervention, occupying a prominent position on the eastern side of the Wye Valley gorge. The Hudnalls is a good example of semi-natural, unmanaged woodland, dominated by beech, oak, ash and lime. This type of woodland on strongly acid soils is virtually unknown outside the Lower Wye Valley. Spring is a particularly good time to visit for the display of wild garlic and other wildflowers. Amongst the rare plants found at the reserve are thick berried bramble and wood fescue. Birds recorded here include song thrush, hawfinch, wood warbler, starling and lesser spotted woodpecker. The woodland also features some interesting members of the fly family, such as the rare cranefly Tipula nubeculosa and the scarce cranefly Scleroprocta pentagonalis. The Hudnalls NNR lies in the Wye Valley on the border between England and Wales, approximately 2 miles south west of St Briavels. The nearest parking is at Brockweir. Regular bus services link the local area to St Briavels Common. For travel details see the Traveline south west website. The reserve is accessible from public rights of way including the Offa’s Dyke National Trail which runs close to both the top (east) and bottom (west) of the site.